You came into our world a little too late. I wanted a daughter from the second week Zia and I got married. You delayed my dreams and arrived two years and three months later. And what an arrival! Our house was like a Christmas tree when you came home. Banners, lights, toys, cradle and all. Like for all first fathers, for me, no one was more beautiful, no one could be smarter, no one could be, well, no one could be ‘Anjali’. As a child you could never admit you didn’t know anything – you had an answer for any question you were asked, and not much has changed. You were intensely curious and were naturally the centre of attention, and the centre of our world. When your two sisters arrived you were a watchful little mother. High strung, intelligent and hard working as hell, you have grown up to be the young woman I always wanted my daughter to be. You are now mature, textured, confident and are already facing the world and dealing with work and life situations with confidence. After returning to India in 2010, upon completion of your BFA in Industrial Design from the Rhode Island School of Design, you started two companies that have now consumed you. You are one of four partners at Skarma; a design led Creative Agency. You simultaneously started Josmo, a creative design studio where you are the creative director and founder. It was four frustrating years without you but you are now back. The house is once again filled with your chatter and laughter. You started with designing bespoke furniture and are now doing bigger jobs and designing your own furniture lines. You have rolled up your sleeves and torn your hair out dealing with carpenters, vendors, trying to give your 100 per cent to your clients. Manufacturing even one chair in India is a learning experience. I have seen you cry in frustration and later laugh with delight when you achieved the end product to your satisfaction. You have learnt to be different things to different people, to adjust and to cope. And when people I meet tell me how much they like your work and professionalism, what would any father feel – on top of the world! You are a soft, emotional woman and you do get overwrought at times. Zia and I agree that you are often high maintenance! So your husband-to-be will have to deal with that for sure. Sometimes I want you to get married soon to a young man who will let you pursue your dreams and be proud of you. Most times I want you only to be with us. I am not sure how I will share you, but at all times I want you to be my Rani, my Anjoss, my Beautiful No 1. 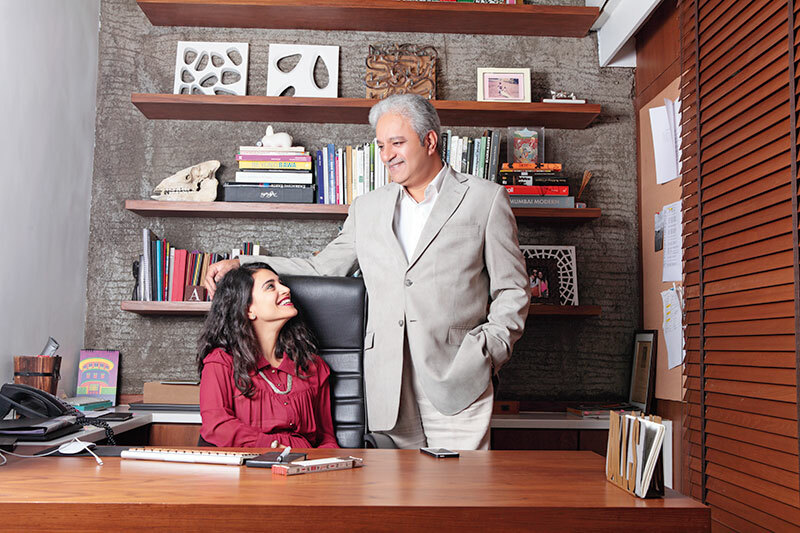 For someone who loves being in the business of uncertainty, Jaydev Mody started out as a humanities graduate from Mumbai University and has been creating, developing and managing businesses for more than 35 years, over 25 of which were in real estate development. Six years ago he ​formed Delta Corp Ltd., now one of the leading players in the gaming and hospitality industry in the country.